A South Dakota 4th of July hot dog eating contest turned tragic when a contestant choked to death. Walter Eagle Tail, 47, of Custer, died at a hospital Thursday after attempts to save him at the scene failed, Custer County Sheriff Rick Wheeler told the Rapid City Journal. “There was someone doing CPR when we arrived,” Rick Wheeler said. “He probably just suffocated. It got lodged in his throat and they [paramedics] couldn’t get it out. “It all happened within minutes,” the sheriff said. The Custer Chamber of Commerce, which sponsored the contest, canceled a pie-eating contest scheduled for Friday. “We are at a loss for words,” Chamber Executive Director Dave Ressler said. 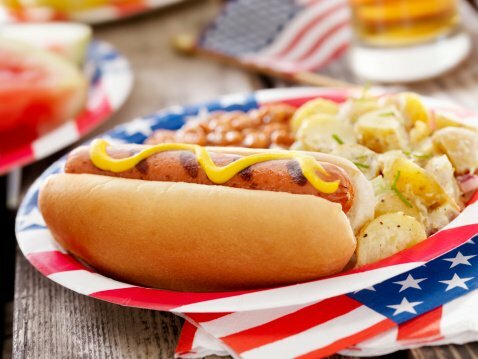 Speed-eating competitions are popular over the 4th of July weekend. Eight-time champion Joey “Jaws” Chestnut managed to eat 61 hot dogs in 10 minutes at an annual contest in Coney Island, New York, on Friday – eight short of the record 69 he swallowed in the 2013 competition. George Shea, chairman of Major League Eating, a competitive eating organization based in New York, said organizers do all they can to prevent casualties during contests. Funeral arrangements were pending for Walter Eagle Tail, whom friends described as a fun-loving, kind and caring man.